Why is it that the simple ideas are always the best ideas? I mean who would have thought to make the wheel round. It's genius. But what about those other little inventions we take for granted, like sliced bread, or post-it notes even. Or what about toilet paper! Life just won't be the same without these simple yet brilliant ideas. What about in-wall mounted speakers? They too are so simple, yet brilliant. Ok, so maybe they are not the next best thing to sliced bread, or loo paper even, but they are pretty handy. For instance, they remove hazardous cables from the floor that are waiting to be tripped over or waiting for the family pet to chew on. They free up space in your home, office or shop by concealing the speaker within the wall. Better still, they are relatively inexpensive and produce quality ambient sound. It's so simple it could be genius. Constructed using woven Kevlar to form a stiff yet light weight cone, these 6.5 inch 2 way Speakers produce quality sound through low to high frequencies. When installed these speakers sit flush to your wall or ceiling and come with the addition of a swivelling tweeter that allows the sound to be adjusted for your listening enjoyment according to your position. These speakers are perfect for entertaining areas and as part of your home theatre setup. If you haven't considered Wall / Ceiling Mounted Speakers, now is the time to do so! Backed with the security of a 5 Year Cable Chick Warranty the Round 6.5" Pair of Wall / Ceiling Mounted Speakers can be installed with peace of mind. Try painting the speaker grill to match the colour of the wall you are mounting them on. Answer: "Yes they are, for the purposes of surround sound though we recommend that they be placed in the wall at listening height (level with your ear) instead of the ceiling (although this will still work nicely)." Answer: "No. These speakers need a 200mm diameter hole, and would fall through a larger cutout. You may prefer our 8" option, which uses a 240mm hole. 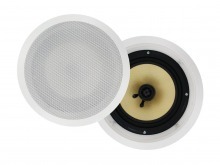 http://www.cablechick.com.au/cables/round-8quot-pair-of-wall-ceiling-mounted-speakers-150w-kevlar-drivers.html"
Answer: "These speakers are not weatherproof and are intended for indoor use. Volume control would be handled by your amplifier/receiver (ie: 2-zone audio)." Answer: "No. These are just a good-quality generic branded product. We've carried these since 2008 and they've had an excellent track record."